Learn about WILD animals with these catchy, upbeat songs -- a Parent's Choice award winning CD! This wildlife-themed CD features animals like baby Juana, the dancing Iguana & a Wombat who scats! 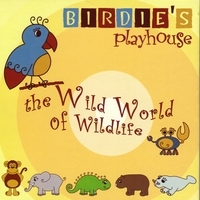 Birdie's Playhouse songs range from Pop to Latin and are dance-able, clever and CATCHY! Put this Spring 2010 PARENT'S CHOICE award-winning CD on, and the little birdies go WILD and end up shaking their tail feathers. "Usually I dread having to listen to "kids" music, but this CD is fantastic! We love "Shake Your Tail Feathers," "Fiddler Crab Rap" & the "Elephant in the Congo." We listen to them over & over & over. Thanks to Birdie's Playhouse for making my morning commute with my son so much fun & educational!" -- Kiersten Elliott * Assoc. Dean, Santa Monica College & Mother of Kinkade (3). My four year old son LOVES Birdie's CD! We listen to it quite often in the car, and the songs are catchy enough that you'll find yourself singing along. We brought the CD to his preschool, and now all his friends talk about "Birdie Mendoza" and ask for the music. They have a great time shaking their "tail feathers" while they dance around the classroom. My 2yo and 4yo LOVE LOVE LOVE it! I came across Birdie's Playhouse at the Pump Station Event last year. She was amazing and it was great interactive fun. I like the fact that music gives an opportunity for children take part in the music rather than just be a listener, it makes you into a participant! Wonderful CD for children young and old! "Can we listen to Birdie, Mommy?" That's what I hear from my 2 1/2 year old whenever I ask him if he wants to listen to music. We love this CD! The songs are fun, definitely catchy, and upbeat - all while educating about animals in the wild and giving a bit of bilingual exposure. We have many different children's CDs and this is the only one my son requests. It's also one of the rare ones that I also enjoy. I hope many more moms out there will choose to share this music with their kids. As Birdie says, "Ole!"